Precision Double Squares are one of the most usefull tools you can have in your shop. Use them for layout, when marking, measuring, and especially for transferring measurements from one board to another, making them virtually essential for joinery work. This 6" double square fits easily in your shop apron and is long enough to work for the majority of your tasks when needed. This Square uses an R4 graduation with inches and fractions. One side features 1/8" & 1/16" graduations while the other side is marked with 1/32" & 1/64" graduation. 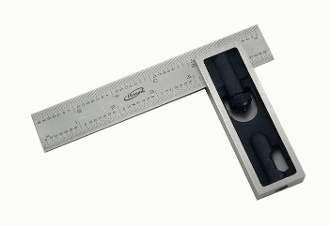 The head can slide to any position on the ruler and remain square. The cast iron head also features a built-in spirit level.